Apologies for being away for so long. I had to work on a project to get some spending money. Now it’s time to get back into some art making, so often not the same thing, unfortunately. 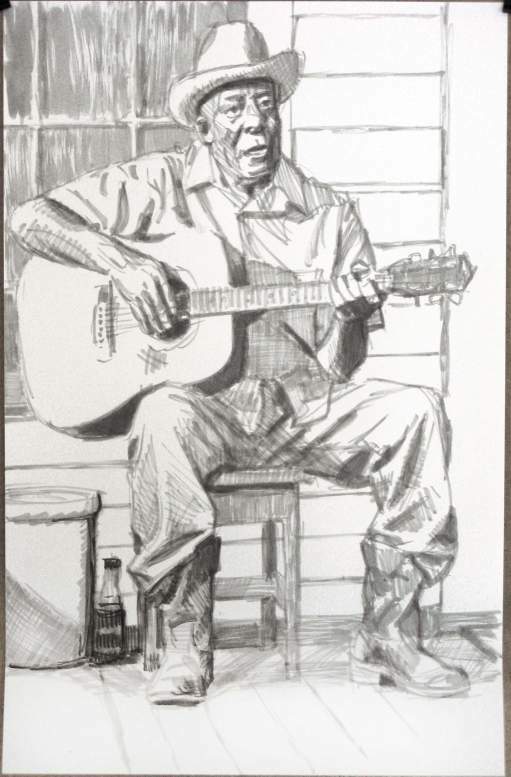 Here’s a sketch I made up recently of my friend Curtis from a frame of video I shot of him playing some Blues, ink on 11 x 17″ paper. A major influence in the art work I make is the inspiration I get from great illustration art of the previous century. 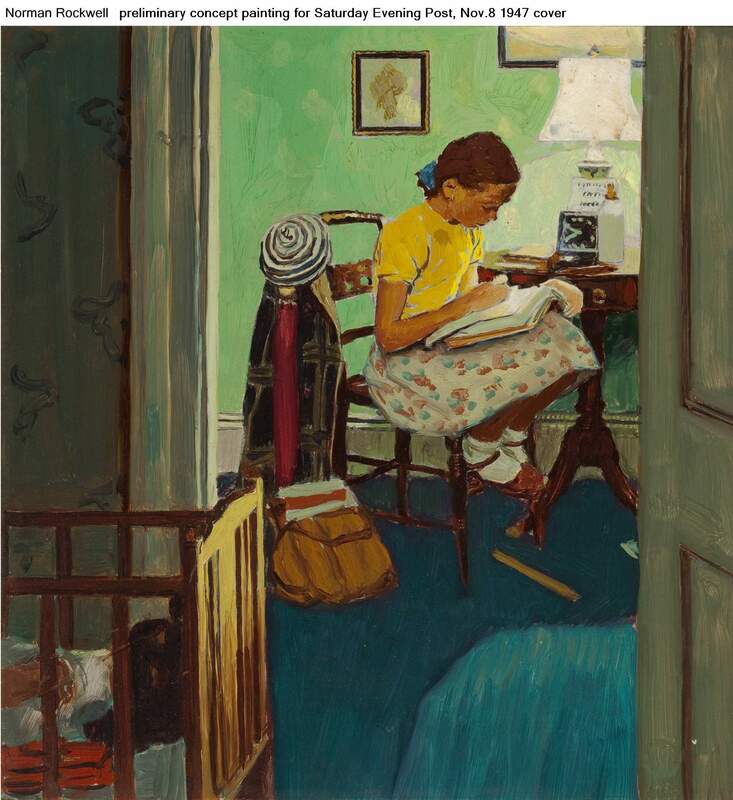 No artist ever achieved greater stature in that genre than Norman Rockwell. I recently came across a sequence of digital files that show the particular method he used to develop the idea for one of his many covers made for the Saturday Evening Post magazine. I stumbled across them out of sequence, but once I had them all collected, they made quite an impact to see how his final concept came together. I was very familiar with the final printed cover, but when I found the first image above it didn’t register with me that it was the same idea, since it was so different from the final painting. I could tell it was a rough sketch, and had the format of a magazine cover, but that was as far as I could take it at the time. The reading I get on the scene appears to be a quiet evening setting with a young girl keeping an eye on the sleeping baby, perhaps her sister, while doing homework. The next image I found was that of the girl wearing a blue blouse, the third image in the sequence. While I could immediately tell it was a preliminary version of the final painting, I still didn’t make a connection with the first image other than it was two pictures of a babysitter. 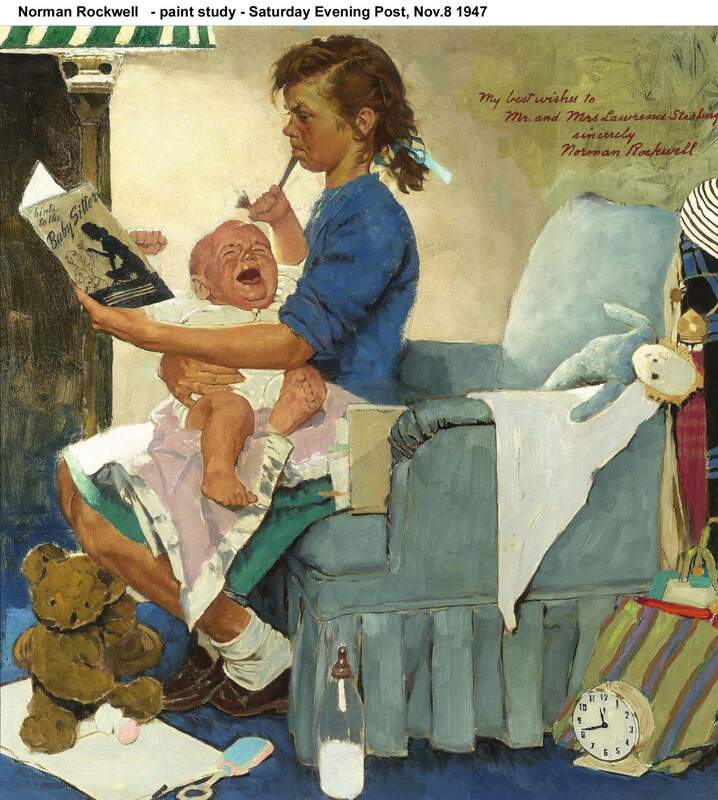 Wanting to find a higher resolution image of this, I searched on “Rockwell babysitter,” and then found the second image. Suddenly the whole thing came together, as his final idea is fully developed. 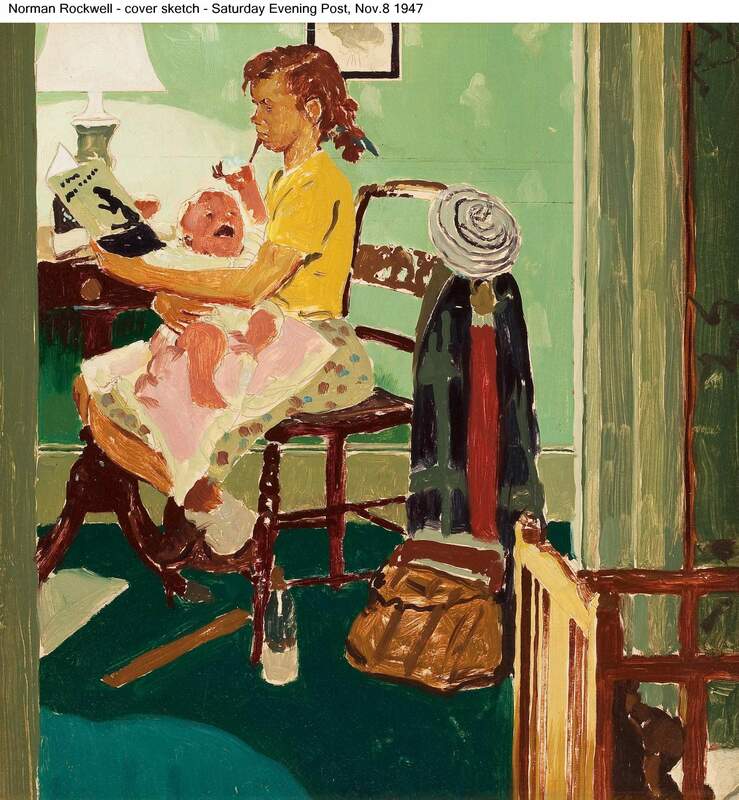 The quiet scene is now replaced with the tumult of a screaming child in her lap as she studies a pamphlet on babysitting. In the third image, he’s moved our point of view in closer, so that we’re not in a separate room with the crib. The furnishing are different, and he’s added a few more props, including bringing back the homework books now placed in the chair, and returned the clock now on the floor showing a late hour. He brings it all home in the final painting by changing the color scheme again, and adding more details. If I can find a higher res version of the printed cover I’d like to see what the title says on the print hanging on the wall. 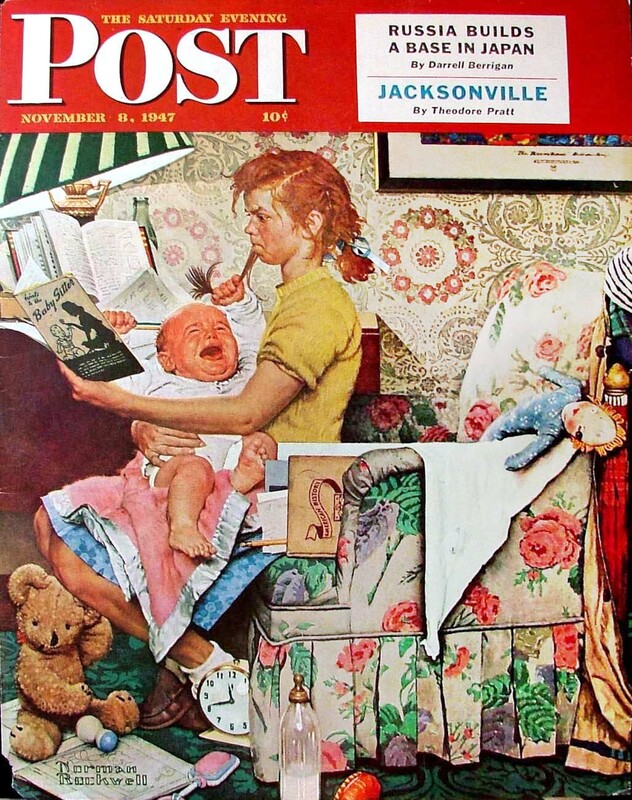 Rockwell had amassed a devoted following of readers that loved to catch these sort of details, and would write in with their own impressions or when they felt he made mistakes, so he had to be careful, and he knew that holding their attention that way was of major importance. So many of these works of art by the great illustrators of the past have been lost or stored away that it’s wonderful the see them in detail, especially when you can see how the artist worked out their ideas. Sometimes you need the printed page as well to see how they had to work with the limitations of the print medium, or that the original art has been damaged or destroyed to a point where the printed version is the more accurate example. A dream I have is a large gallery and library that brings all of this together for study and appreciation well deserved. 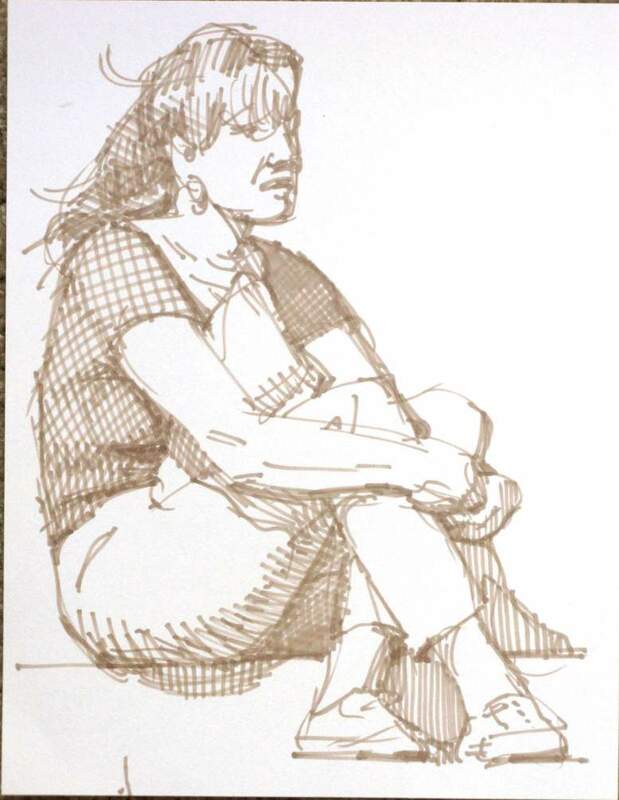 This is a sketch from yesterday of my friend, Cathy, scanning through an art supply catalog. She’s a sculptor. 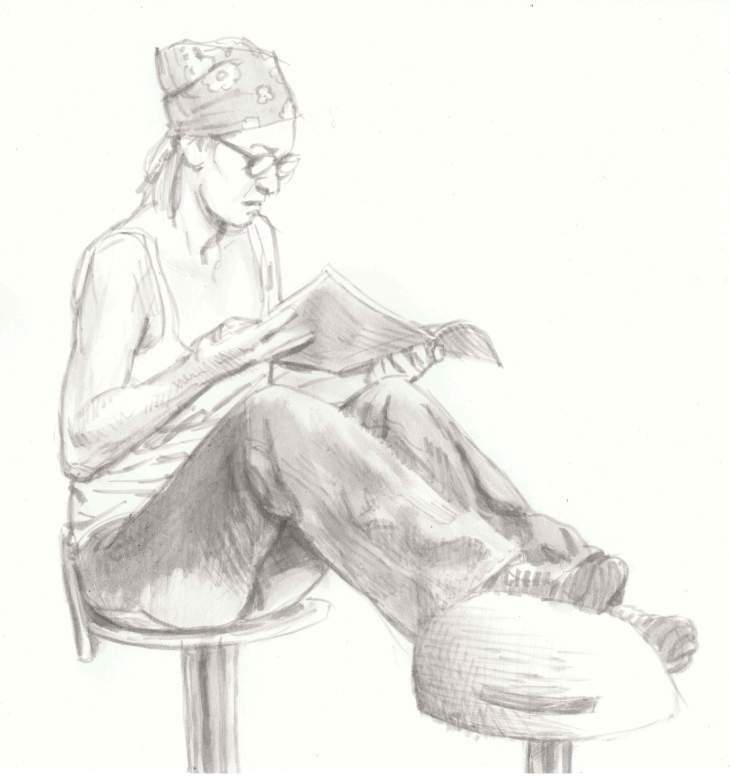 I drew her arms first so she could continue to flip through the magazine while I drew the rest of her. She appreciated that, I think. 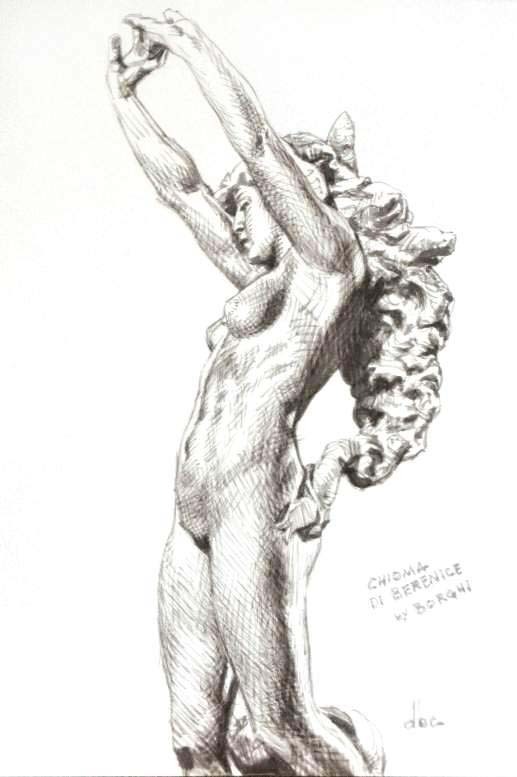 It was too hot to step outside today, so I spent time looking for something to draw online, and found a photo of a sculpture by Ambrogio Borghi called “Berenice’s Hair” (Chioma Di Berenice) that I thought would work. 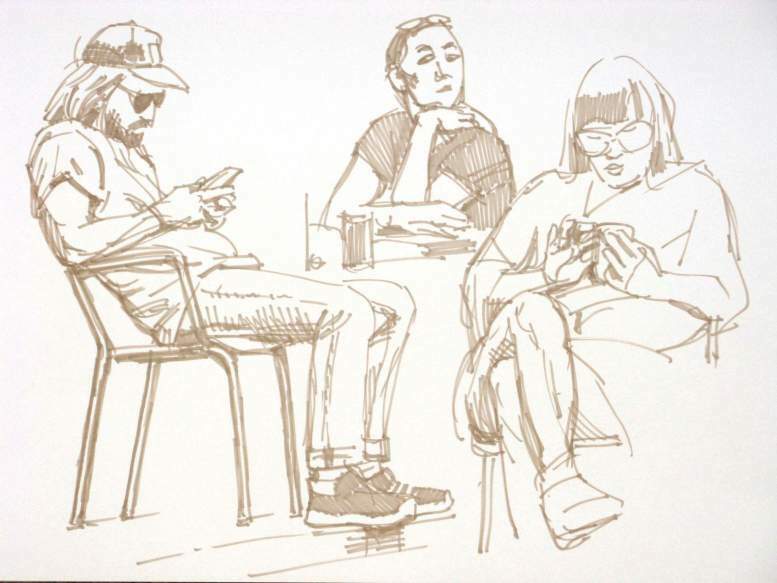 Drawn with sumi ink with a Pentel water brush, @ 10 x 17″. I was visiting a friend down in Bastrop, TX yesterday, and we spent some time at a nearby park and cafe. 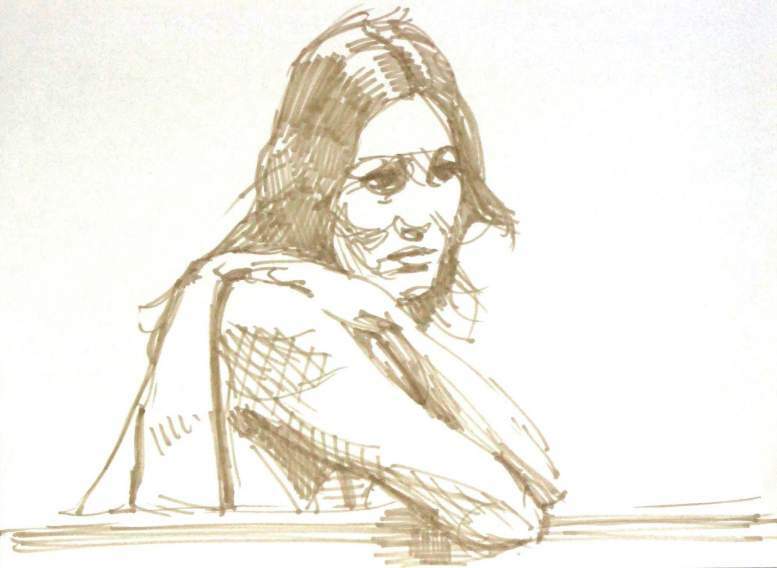 She got some sun, and I made a few sketches of the locals. I used a Prismacolor Premier layout marker. You are currently browsing the Artwork by D. B. Clemons blog archives for July, 2018. Enter your email address to follow this blog and get notifications of new posts.